After that we all ordered something. Madie and Kenndy got choclate chip pancakes with bacon and sausage.. Me and livy got build your own grand slam. Mom got a french toast slam and my dad got an omlet thingy. 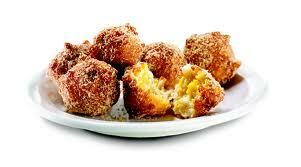 You’ll never guess what Quin got , she got these super cute little pancake puppies. I had one. They are really yummy. espicially when tou dip them in syrp. When we were finishing up I looked outside. 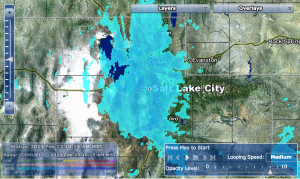 There was a giant snowstorm!!!!!! That really came out of nowhere. I told everyone, they were pretty surprised too. That snow storm made the drive home espicially hard. We were only going like, five miles an hour. My dad went and got the truck so we wouldn’t all have to go through the snow, but most of the kids wanted to anyway. My mom made them stay inside and wait for the car. Well… we finally got home and it was still snowing. I am getting tired of it. But that is another post. I love your posts mya! It helps me know what you guys r up to. I miss u! 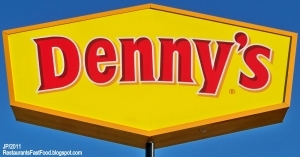 Denny’s is a yummy place! Sounds fun! The comment above is from me! 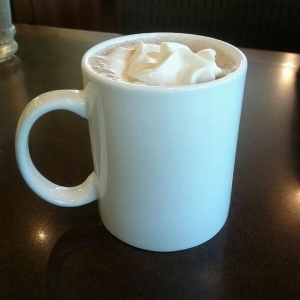 Agreed, Denny’s does have the best hot chocolate (probably because of the massive amount of whipped cream they give you…). Thanks for posting. I hope it stops snowing soon. That would drive me crazy too! Yum! I love breakfast food. I am glad you got home safely!